A top-level meeting President Maithripala Sirisena held with a group of senior Army officers has ruffled feathers in the defence and security establishment. Neither Defence Secretary Karunasena Hettiaratchchi nor Army Commander Lt. Gen. Chrisanthe de Silva had prior knowledge of the meeting. Most of the nine senior officers who met President Sirisena at a hotel in Negombo, while he was on a visit there, played a pivotal role in the final stages of the battle to defeat militarily the Tiger guerrillas in May 2009. The officers, some of whom are due for retirement reaching 55 years, are learnt to have explained the roles they played during the military operation. The explanations come in the wake of the UN Human Rights Council resolution in Geneva. Sri Lanka, which co-sponsored it, has agreed to set up a court with international judges to try those responsible for alleged war crimes. Eyebrows over the issue were raised after both the Defence Secretary and the Army Commander learnt of the event only after the Negombo meeting had taken place. It has now come to light that a former official in the Defence Ministry had arranged the meeting with the help of a minister. 1. “With immediate effect visiting the Ministry of Defence and other related high officers shall obtain permission from the Commander of the Army through Military Secretary. This rule shall be applicable even where the officer is called upon to visit by the MoD or higher office. Those who met President Sirisena at the Outreach Hotel in Negombo were Major General Jagath Dias, Chief of Staff, Major General Mahinda Hathurusinghe, Adjutant General as well as Colonel Commandant, Sri Lanka Artillery, Major General Kamal Gunaratne, Master General Ordinance, Major General Shavendra Silva, Defence Services Staff College, Major General Nandana Udawatte, Security Forces Commander, Jaffna, Major General Prasanna de Silva, Military Liaison Officer, Ministry of Defence, Major General Jagath Alwis, awaiting a posting from AHQ, Major General Prasanna Silva, General Officer Commanding 51 Division and Major General Chagi Gallage. The meeting between these senior officers and Sirisena came as Army Headquarters in Colombo is busy formulating its own responses to matters that may surface before special courts that the Government will establish to hear alleged war crimes. Legislation for this purpose is to be introduced in Parliament in the coming year, a move which has caused some concern among sections of the Sri Lanka Freedom Party (SLFP). The current thinking in the Government is to establish such institutions as High Courts dedicated to probing alleged war crimes. At a meeting with President Sirisena before he departed to Malta, MPs raised issue with him. He asserted that such courts would have to be set up since the Government had given an undertaking to deal with human rights violations but did not elaborate how they were to be set up. 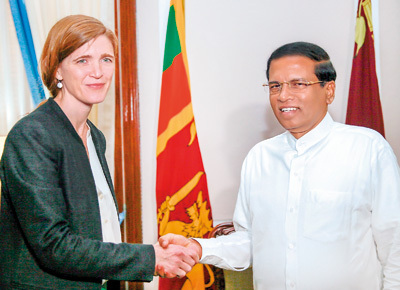 The issue also came into focus over the weekend during the visit to Colombo by Samantha Power, US Ambassador to the United Nations. The much publicised events she took part notwithstanding, her mission covered progress made by the Government towards implementing recommendations contained in the US-backed resolution in Geneva. That seemed a reminder that the issue is still high on the US agenda vis-à-vis its relations with Sri Lanka. She did so at three different levels, with Foreign Minister Mangala Samaraweera, Prime Minister Ranil Wickremesinghe and President Sirisena. The informal diplomatic pressure from the United States was not the only factor this week. An official legal delegation from the Office of the High Commissioner for Human Rights (OHCHR) was also in Colombo this week to determine the progress made in respect of implementing provisions of the UNHRC resolution. They held extensive talks with officials in the Ministry of Foreign Affairs on the different mechanisms the Government has offered to set up. This includes the establishment of special courts where international judges would be included, a mechanism for preserving all existing records and documentation relating to human rights violations and abuses as well as violation of international humanitarian law. The delegation has expressed the view that a witness protection mechanism should be put in place by June next year. The Government has already passed required legislation for witness protection to be enforced in different phases. They have also made clear that the Government should have a time line within which specific provisions in the resolution should be implemented. There has been a spurt of Government activity related to matters arising from the UN resolution in the past few weeks. One such instance was a move to release LTTE guerrilla suspects now in custody. While measures are under way to release those who have not been served charges, legal impediments will prevent the release of those against whom action has been filed in courts. Private plots of land held by the military in the North have been gradually restored to their original owners while surveys continue to identify more such land. Business ventures carried out by the military outside its encampments including restaurants and other shops along public roads have already been shut down. However, the Government is yet to decide on major investments by the military in major hotel projects and other tourist ventures. The Government is in consultation with the UN to find slots for Sri Lankan troops in UN peace keeping operations worldwide. The issue of hardships for the people has become the subject of concern for a few Sri Lanka Freedom Party (SLFP) members and ministers. They aired their grievances at a Friday meeting chaired by Prime Minister Wickremesinghe. In attendance was Finance Minister Ravi Karunanayake. Wickremesinghe said yesterday that most issues raised by ministers were on the need to provide cash subsidies to the coconut and rubber industry too. They said it should be extended to over a hectare, which is the ceiling imposed in the budget. He said Finance Minister Karunanayake had agreed to make possible adjustments. The other common complaint was the lack of funds for projects in their electorates. “We have to address the issues raised by them. They will have to keep their own voters happy,” he said. Another group of MPs, widely regarded as pro-Mahinda Rajapaksa, sought a meeting with President Sirisena to discuss matters relating to the budget. At first, he said, they should meet up with the ministers concerned. He later agreed and a meeting followed another day. It was parliamentarians Dullas Allahapperuma and Kumara Welgama who began the conversation. They said they were going to vote against the budget. Sirisena replied that they should vote for the budget and said otherwise they would not be able to deliver the benefits to their respective electorates. Bandula Gunawardena was to add that “if we do not object now, we will be mistaken to be a party to the budget. It is in the interest of the party that we do not support it.” Sirisena said he was unable to give two different opinions, one in their favour and another for the party. As far as he was concerned, he had endorsed the budget and that was the SLFP’s view too. Ministers S.B. Dissanayake and Nimal Siripala de Silva said the MPs should vote in favour but others including Keheliya Rambukwella, Mahindananda Aluthgamage, Kumara Welgama and Bandula Gunawardena declared that they would not. As the meeting ended, moves for a vote of no-confidence against Finance Minister Karunanayake were taking shape. After 44 MPs, mostly UPFA constituents and SLFP MPs backing Rajapaksa, had signed it, it was handed over to Speaker Karu Jayasuriya. Those backing the no-faith move had been consulting lawyers to ascertain the legal consequences if they voted against the budget. The advice, one source said, was that they could face expulsion if they had not raised objections within the parliamentary group itself and gone on record over it. Sirisena has told his confidants that he would take ‘appropriate’ action against those defying his appeal to support the budget. This, in fact, has added to the woes of the dissidents. They had earlier been livid with National Freedom Front (NFF) leader Wimal Weerawansa, after he had placed Sinhala newspaper advertisements calling for applications from candidates to contest on his party’s ticket at the upcoming local elections. “If he grabs our fellows, what are we going to do,” lamented one of the dissidents to their leader. He pointed out that their membership will get depleted and there will not be many with them. It was decided to talk to Weerawansa too, after he returns from a European tour. Weerawansa is addressing Sri Lanka groups in some countries about what he calls the dangers posed by the Geneva resolution. Another undisclosed issue, his party insiders say, is to raise funds for the local government polls. That message seems to have seeped into other party cadres too. On Friday evening, the D.A. Rajapaksa memorial oration was delivered by Dinidu Kumaratunga, a relative of the late Munidasa Kumaratunga. Giving an overview of the political developments, he suggested that it was time to form another party like the SLFP. Both Mahinda Rajapaksa and brother Chamal, former Speaker, were present at the event. The subject became the topic of discussion among those present. Yet, most signatories to the no-faith move, one source said, may refrain from voting and thus try to minimise the disciplinary action they are likely to face. There was some confusion and speculation that arose as a result of a chance meeting between President Sirisena and former Minister Basil Rajapaksa. It was at the wedding of the second daughter of former Minister Arumugam Thondaman. Basil Rajapaksa had chosen to go to the wedding at Thondaman’s residence at noon when he had hoped most VIPs would have come and gone. However, when he was seated in the hall, Sirisena arrived and occupied a table near the entrance. Basil who wanted to make a hasty exit, for his misfortune, was stopped by a personal security detail of Sirisena. This was to allow Sirisena to make his exit. Sirisena who rose from his seat turned backwards to see Basil standing right there. “Kohomada” or how are you? he asked. Basil said he was well. Sirisena was to remark that he arrived late since he had to fly to Matale for the opening of the Mahatma Gandhi Centre. If that chance meeting was cause for speculation in some circles, there was bad news for Basil Rajapaksa the next morning. He received a Police message that he has to turn up at the Special Investigation Unit (SIU) of Police headquarters to make a statement. He presented himself and was to tell a friend that his travails were not ending. For the Government, on the other hand, proposals in the budget are not the only issue in focus. Mounting criticism that it has not done much that is tangible to cope with bribery and corruption, another element in the Geneva resolution, has spurred the Government into action. It is now studying a draft policy and framework of action to “efficaciously combat corruption and fraud”. This has been recommended by members of the Presidential Task Force for the Recovery of Stolen Assets. It has recommended changes in the Commission to Investigate Allegations of Bribery or Corruption Act. It is firstly to re-name it as the Independent Commission to Investigate Allegations of Bribery or Corruption. The territorial jurisdiction of the Commission is to be expanded enabling it to deal with offences committed by Sri Lankans overseas. The Commission is to be empowered to disseminate intelligence and investigational findings to other law enforcement agencies which shall not be deemed to amount to a breach of confidentiality. The Commission is to be empowered to prosecute state and private sector individuals and corporates. It will have a data base and monitor the acquisition of assets by specified persons. It will be empowered to conduct prosecutions either by itself or outsource it to the Attorney General. Even those outside the Police Department are to be enlisted as investigators. The Police Ordinance is to be amended to establish a Financial and Economic Crimes Investigation Department (F&ECID) instead of the existing FCID. It has been recommended that such a body, in the first instance, be established by the Police Chief through a Gazette notification. In terms of the recommendations, a separate Unit to be named Prosecution of Corruption and Fraud Unit in the Attorney General’s Department is to exclusively deal with matters pertaining to the FCID and the CIABOC. It is to function under the Attorney General and is to be headed by an Additional Solicitor General with ten senior officers. Give a view toward ensuring that all significant legislation projects, programmes, or agencies within its jurisdiction are subject to review every 10 years. A Minister may refer any matter to the relevant Oversight Standing Committee having jurisdiction over the subject, function, department or institution coming under the Minister. The Speaker shall refer each Bill, regulation, resolution or other matter that relates to a subject listed under an Oversight Standing Committee above in accordance with the provisions of this Standing Order. The Committee which has primary jurisdiction shall fix a deadline within which the Committee asks for an opinion and must deliver if it is to be taken into account in the Committee which has primary jurisdiction. Each Committee when acting in the exercise of its jurisdiction shall submit to the Speaker a report in respect of each item considered by the Committee. The Speaker shall cause such report to be tabled before Parliament. Any Report by a Committee on any Bill or regulation shall comprise draft amendments if any to the proposal accompanied, if appropriate by short justifications. Any such amendment to a Bill will be submitted by the Speaker to Parliament during the Committee stage of such Bill under as an amendment moved by the Chairman of the Committee or such other member designated by the Committee. Any such amendment to a regulation will be submitted by the Speaker as an amendment moved by the Chairman of the Committee or such other member designated by the Committee. (c) Parliament may by motion approve the recommendations of any non-legislative report placed before Parliament. The Sectoral Oversight Committees come in the wake of the United National Party’s pledge that it would ensure a greater role for Parliament in governance. Quite clearly, the complaints against the Government are not over re-structuring the state mechanisms for tackling bribery or corruption. To the contrary, it revolves around that fact that despite many pledges, particularly ahead of presidential and parliamentary polls, no tangible action has been taken against any one in many high profile cases. Whether that will see the light of day seems an important question. With regards to issues related to the Geneva resolution, events this week have made clear that the Government will not be able to ‘free wheel’ using the goodwill of the prime mover of the resolution on Sri Lanka, the United States. The visit by the legal team from the Office of the High Commissioner for Human Rights (OHCHR), a direct consequence of the resolution, lays bare that matters are being monitored closely. Thus, Foreign Minister Mangala Samaraweera, who has been pursuing issues related to the resolution now, has a bigger task. He not only has to implement provisions in the resolution but also prepare himself to brief the UN Human Rights Council at its March sessions on what progress has been made.